So from now up until "The Grandest Stage of Them All" (with a little help from Wikipedia to fill in the blanks), I will release my Top 50 wrestlers of the 1990, factoring in their impact from the kid-friendly first half to the cuss-ridden, beer drinking second half to determine where exactly your favorite heel or face fall in rank. Vader’s 1990s was almost evenly divided by three separate runs in Japan. He started it in New Japan as a main eventer, then returned in 1996 for a one-off with legend Antonio Inoki and closed the decade down with time in All-Japan. Vader was figuratively and literally huge in Japan so it was only a matter of time until the bolder from Boulder made his way to the States. WCW roped them into their web of disarray as a full-time worker in 1992 and became a prominent monster heel for the likes of Sting, Nikita Koloff, Ric Flair and Cactus Jack. Vader would become the WCW Heavyweight Champion three times during his stay and would also win the U.S. Title. 1995 would find him feuding with Hogan in the World Title picture again in the role as an unstoppable monster, which obviously, Hogan ended up winning. Vader would then get fired and go to Japan to have a one-off match with the legendary Antonio Inoki before going to the WWF. Vader was built up big-time for his WWF run and destroyed everyone in sight including “WWF President” Gorilla Monsoon when he showed up on the scene. He started a feud with Yokozuna and eventually found his way into the WWF Championship picture with Shawn Michaels. Both being extremely difficult in their own right to work with, the two were far from a match made in heaven and the feud ended with Shawn winning at Summer Slam. 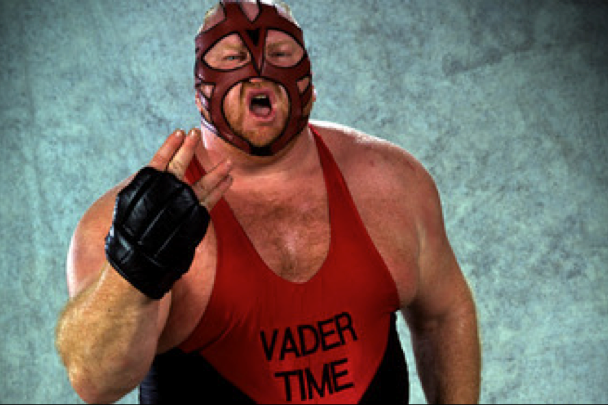 The hands of Vader time would tick towards The Undertaker and then eventually towards him being on the American side of the feud with team Canada’s Hart Foundation. This is where Vader became a babyface and he stayed that way until he fizzled out of the company in late 1998. His WWF run wasn’t as significant as his times in WCW or Japan, but Vader’s tenure in the latter proved just how big of a star he was in the 90s.